France is beautiful anytime of year but as with everything it glows more beauty during the holidays. Our video elf, Kringle was enjoying some locally made cheese and bread when he heard a commotion on the streets. 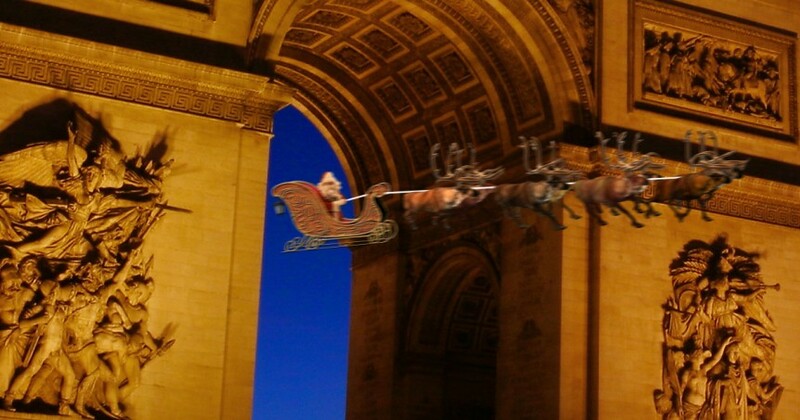 He grabbed his camera and ran toward the commotion right next to the Arc De Triomphe. Everyone was excited because Santa Claus was taking a joyous ride through the European skyline. In France children do no hang stockings by the fireside but rather place their shoes there for treats from Santa Claus. The enjoy a bountiful dinner called a réveillon, which means “waking” because to join this dinner you must stay up to midnight for the festivities.